When it comes to managing projects, forget about having post-it notes stuck all over your office furniture or scraps of notepad paper strewn about. The power of apps and/or web tools can add a level of harmony to your project by tracking tasks and deadlines and encouraging collaboration among your team members. While not every tool will meet your specific needs, we've listed some of our favorite project management apps below. Each offers a unique approach and has a set of pros and cons so you can decide what will work with your style of organization (and type of project). Real-time monitoring of all projects. Offline mode on mobile apps. Integrates with Slack and Microsoft Teams. Mobile app versions not as robust as browser version. One of the first things you notice about Asana is its initial simplicity and easy-to-use interface, which allows you and your colleagues to get up and running in no time. Even the most non-technical folks in your crew can get a quick handle on the app's task-centric tree structure, as well as its messaging and file storage system. Each individual can be assigned basic or complex tasks, coupled with deadlines and expectations. Rather than having to call, text or email back and forth whenever feedback is needed or to clear up any uncertainties, Asana lets all such conversations take place within the respective task's dedicated space. This not only comes in handy short-term​ but is an excellent repository for future reference. While it may be well-suited for beginners, Asana's Basic version provides advanced functionality for teams with more than 15 members including in-depth reporting, secure admin controls, custom templates and priority customer support should you have any urgent questions. There are also Premium, Business and Enterprise editions that offer advanced team and user-level management, custom branding and white glove service when it comes to trouble tickets and other issues. The basic version of Asana is free to use and can be accessed on all major operating systems, while the price for Premium, Business and Enterprise versions vary based on team size and the level of administrative control required. Apps for Slack and mobile devices. Use it solo or invite others. Kanban card system may confuse new users. Doesn't include time-tracking or billing. Like many other project management tools, Trello's interface is heavily influenced by Kanban Boards, which are essentially a visualization of your project's tasks and components broken out into individual cards. 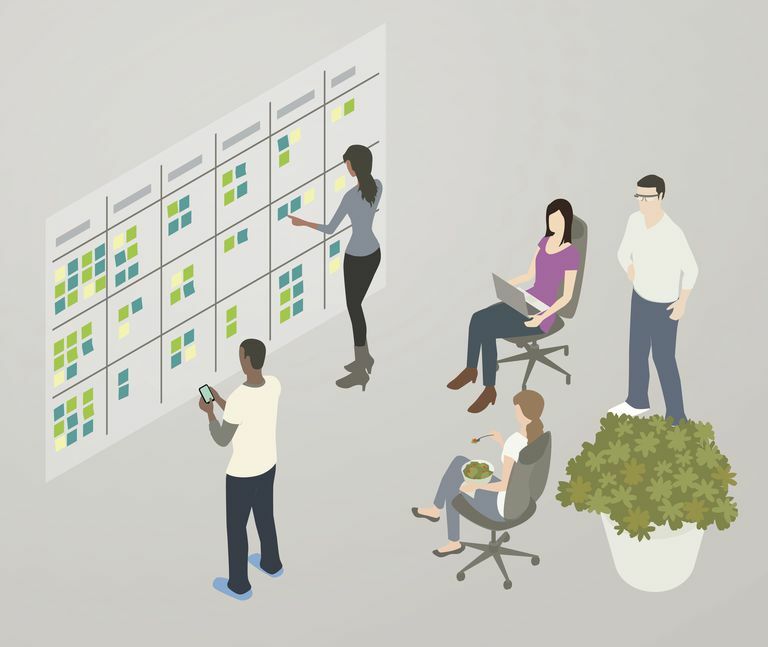 The original Kanban Boards, often found in conference rooms, were comprised of a ​whiteboard and multi-colored sticky notes organized in a fashion that made sense for your particular workflow. Trello takes that concept and enhances it in a big way, letting your virtual boards be used for something as simple as a daily to-do list to creating more complex cards with file attachments, images, videos and more which can be collaborated on by whomever you choose to grant access. No matter if you're using the browser-based version or one of Trello's mobile apps, you're given the ability to work offline and then sync up your changes the next time you're connected. Trello's basic version is available for free, while paid upgrades to Business Class or Enterprise unlock a litany of extra features including the ability to administer large teams and control their individual interfaces from a single dashboard. The tool offers Power-Ups which allow you to integrate dozens of popular applications such as Box, Dropbox, Github, Evernote and Twitter right into your Trello boards. Users running the free app can only have one active Power-Up, while the paid versions permit unlimited Power-Ups. Live classes weekly for new users. Doesn't integrate with other applications. Basecamp 3 provides everything that you'd expect from a project management app and more, doing it all in a streamlined UI that lets you run a full-fledged operation in real-time from right within its virtual walls. Tasks, calendars, file storage, live collaborative documents and topic-specific chat sessions are presented in a way that everyone working on your project can stay current and also have a clear, concise picture of what they should be doing both in the short and long-term. The team behind Basecamp was voted one of Forbes' top small companies in 2017 and they've deviated from the per-user or project-based model when it comes to larger businesses, charging a flat rate of $99 per month or $999 a year — with non-profits or charities getting a 10% discount. Students and teachers that wish to utilize Basecamp's tools can do so free of charge, however. Includes financial, task, and project planning. Integrates well with Office 365 tools. Doesn't work like most project management tools. One of the more tried-and-true options on the list, Microsoft Project has been around since 1984 and claims a base of over 20 million users. This is due in large part to its direct integration with the corporate, enterprise version of the company's Office suite, which is the software of choice for some of the world's largest companies. You're going to pay if you want to use Project, and its feature sets — while robust and reliable, especially when factoring in how well it works with Excel, Word and Outlook — are more suited for businesses of a significant size. Easy time entry and reporting. Custom reporting not beginner friendly. WorkflowMax is a different kind of project management software, designed to help small businesses keep track of time spent on individual tasks and providing the ability to invoice and bill accordingly based on these metrics. While it does not fit into the same mold as the other apps on this list, it can certainly prove useful when paired with one of them in the event that your particular projects involve paying for or being paid on a task or milestone basis. Although not designed specifically for project management, many cloud-based packages like Google's online suite containing apps like Docs and Sheets as well as Microsoft's Office Online allow for collaboration from multiple sources on word processor documents, spreadsheets, calendars with reminders, to-do lists, etc. Depending on what your requirements are in order to get organized and work together as a group, one of these secure and well-known solutions might just be a good fit.